OnlineMathLearning.com offers online math worksheet generation for addition, subtraction, multiplication, division, decimals, fractions, integers and mental math. Here’s an example of how a multiplication worksheet generated by OnlineMathLearning.com looks like. It’s a simple multiplication table for the number 3. Empty input fields are there for typing in the answers, obviously. 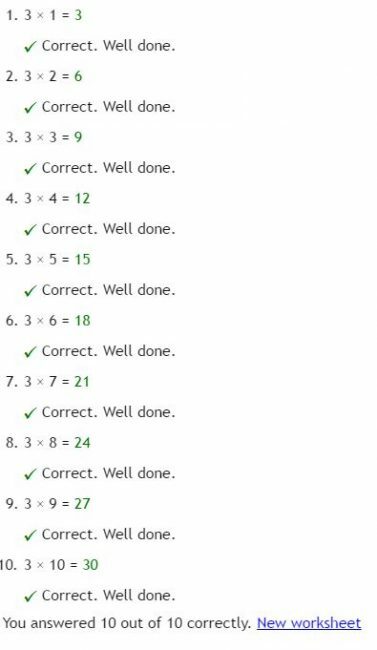 Once the kid fills in the answers they can then submit them and the website will report back on how good the answers where. Worksheets are pretty simplistic and straightforward. 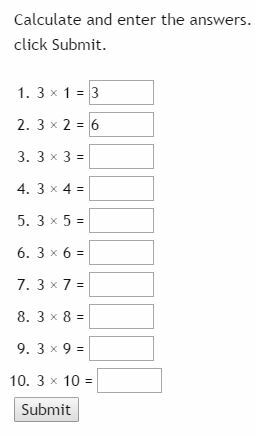 Website is great for multiplication tables practice, subtraction, addition, division and what I especially like is mental math exercises. There are more complex assignments of doubling, halving and squaring numbers that can be setup. These sections, alongside complex numbers, geometry and algebra are a bit more advanced, for students who are a bit further along in their studies. It’s an interesting tool. Although I would love it if they would allow you to print the worksheets on paper. But it’s quite helpful as an online tool only.